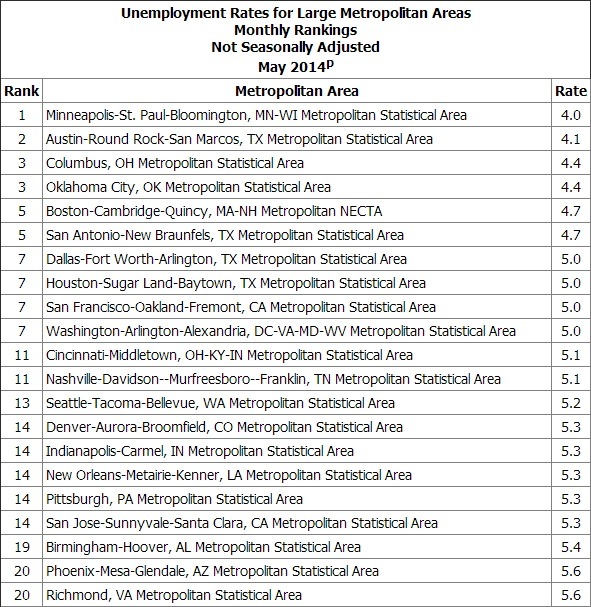 Minneapolis-St. Paul has the lowest unemployment rate of any large metropolitan area in the United States, according to the data released today. The Twin Cities unemployment rate of 4.0 percent came in just a bit lower than Austin, Texas, at 4.1 percent, and Columbus, Ohio, at 4.4 percent. The Minneapolis, St. Paul and Bloomington metro area has twice the population of each of the other two metro areas. Rounding out the top five are Oklahoma City, with an unemployment rate of 4.4 percent, and Boston, with an unemployment rate of 4.7 percent. Here are the top 20 from the Bureau of Labor Statistics. The figures are by place of residence, and are up-to-date as of May.